You should know that your living room shelving isn’t just for storage purposes. It plays an important part in keeping the space alive and aesthetically pleasing. 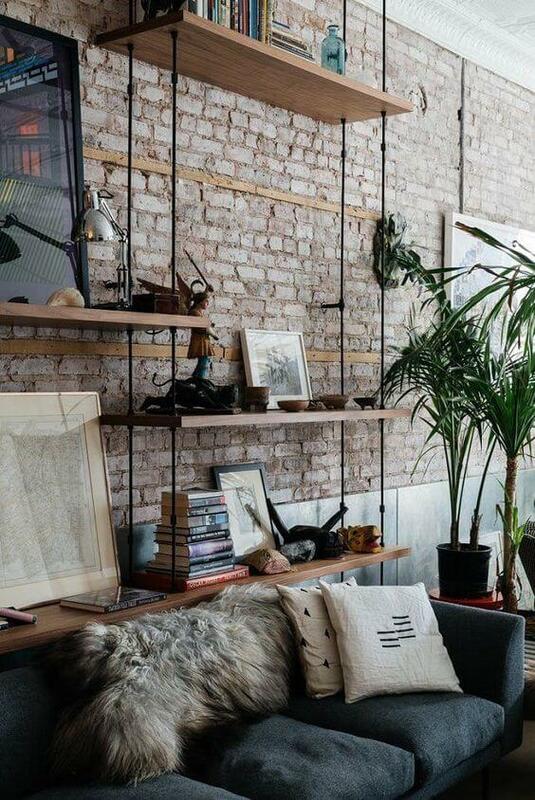 You can turn a dead space into a feature wall just by installing floating shelves and displaying attention-grabbing ornaments and objects. Here’s the thing: there are a lot more shelf designs other than floating shelves. In this blog post, we’re going to show you all your options so you can assess the right one for your space. If you already have one or two shelf designs that we’ll mention on the blog, rest assured that we’ll teach you how to fill it up without feeling cluttered. One way to do this is to build two identical shelves which frame the fireplace. It will help create symmetry in the living room. Do this if you want to achieve harmonious, elegant, and balanced interiors. Take a look at the featured design below. 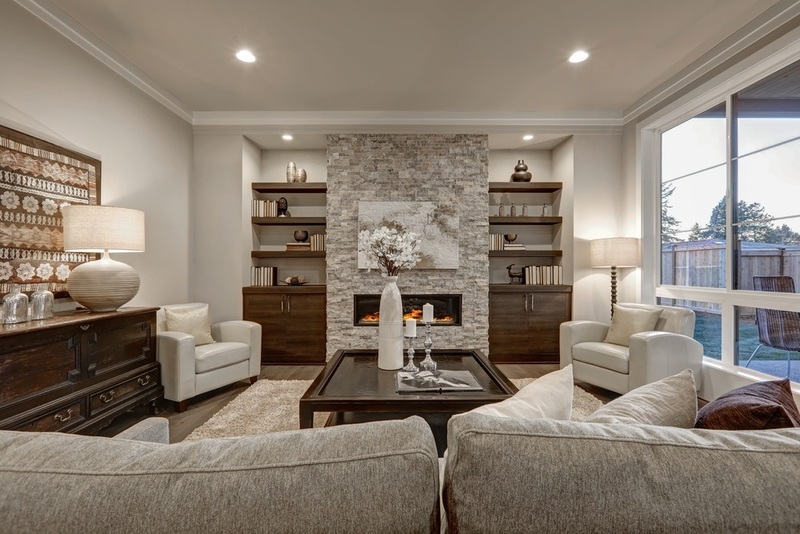 See how the shelves and cabinet highlighted the fireplace? The warmth from the wooden shelves and cabinets made the area cosier. In addition, the floor-to-ceiling alcove will virtually increase the height of your living room. Superdraft Tip: Keep at least 35cm. of space between your shelves. This allows you to display medium-sized ornaments and books. You also need to keep your displays virtually balanced, or you’re not embracing symmetry at all. Stand on the opposite side of the room, face the area, and see if your arrangement is balanced. Never forget the central element above the fireplace. It can be a painting, mirror, clock, the TV, or anything large enough to be the centre point of the space. Take a look at this Russian apartment’s bookshelf in the living room. See how the geometric play made the white wall extraordinary? 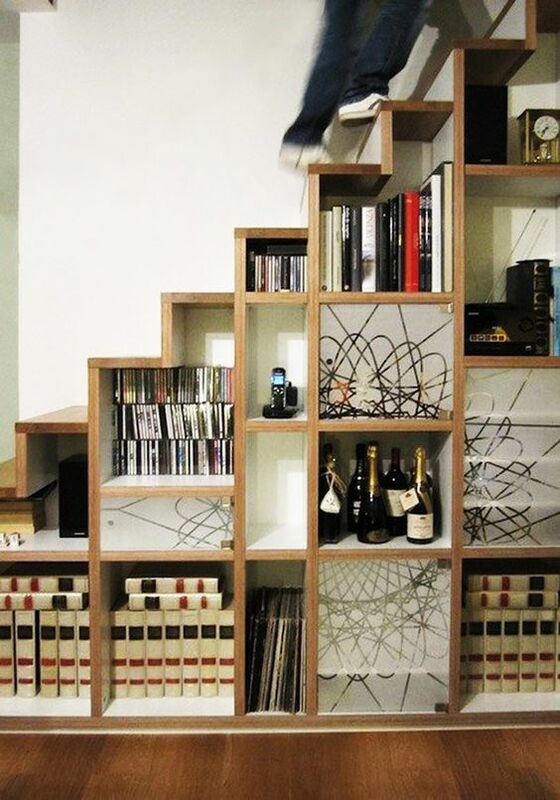 The architecture of the shelves is as interesting as the items you’ll store in it. Here’s something easier to do and add to your living room. 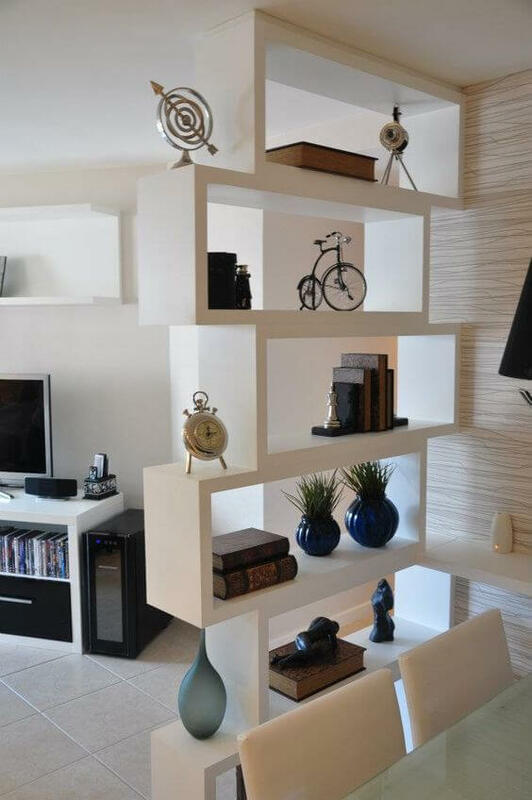 Unfortunately, the diamond shape of the shelves only allows you to store books, CDs, DVDs, and other stackable items. Superdraft tip: Make the diamond shelf 32-35cm wide and 25-28cm deep. That’s enough space to fit large and thick books. Note that this bookshelf design is already an attention-grabber, so keep the display minimal. This is a crowd favourite: a go-to storage and design element when you have an empty wall in the living room. Notice how the floating shelves made that small corner of the apartment more functional? The contrast of that small corner from the rest of the wall creates two zones—one for putting decor items on a shelf and one for hanging paintings and pictures. You can also try petite floating shelves like the ones pictured below. This is great for books and decorative items. Control the contents of each shelf. It must not look cluttered and overcrowded. Superdraft tip: Floating shelves also come in different shapes. 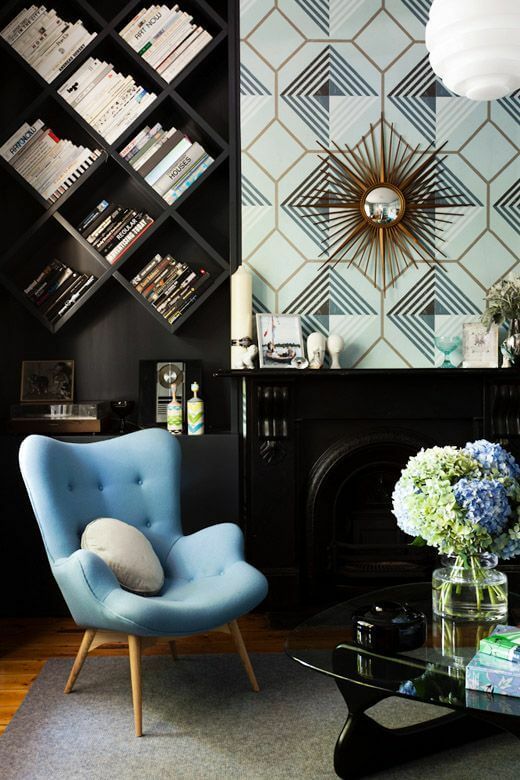 Geometric ones are eye catchers and will effortlessly enhance your wall. 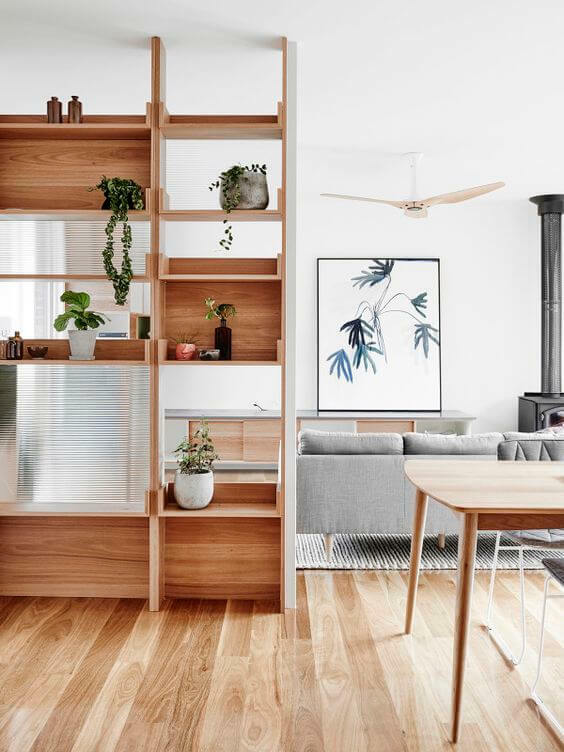 The floor-to-ceiling shelf shown below acts as a freestanding room divider, separating the living from the dining area. Unlike a solid wall, a shelf divider keeps the entire floor bright and area. 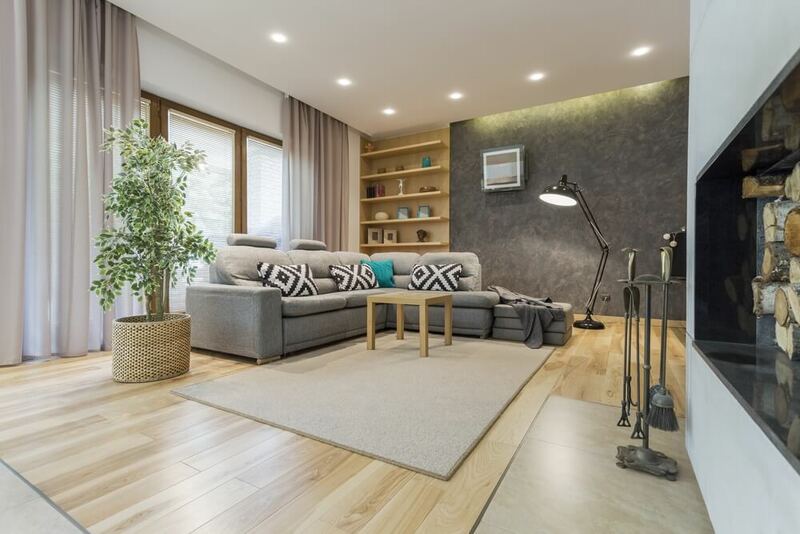 It’s a great addition to a space with an open-plan layout. These shelf dividers are available in most furniture stores in the country. Choose from a wide variety of sizes, colours, and designs. 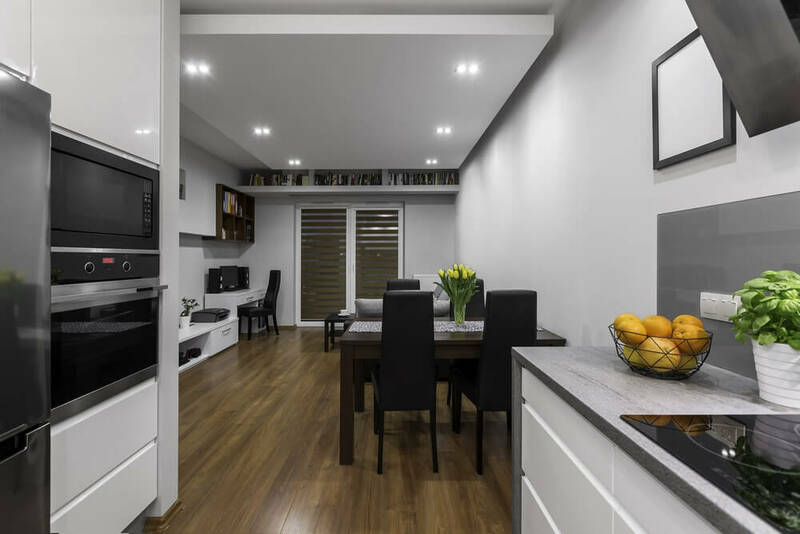 Of course, you need to plan your new layout before purchasing and installing it in your home. 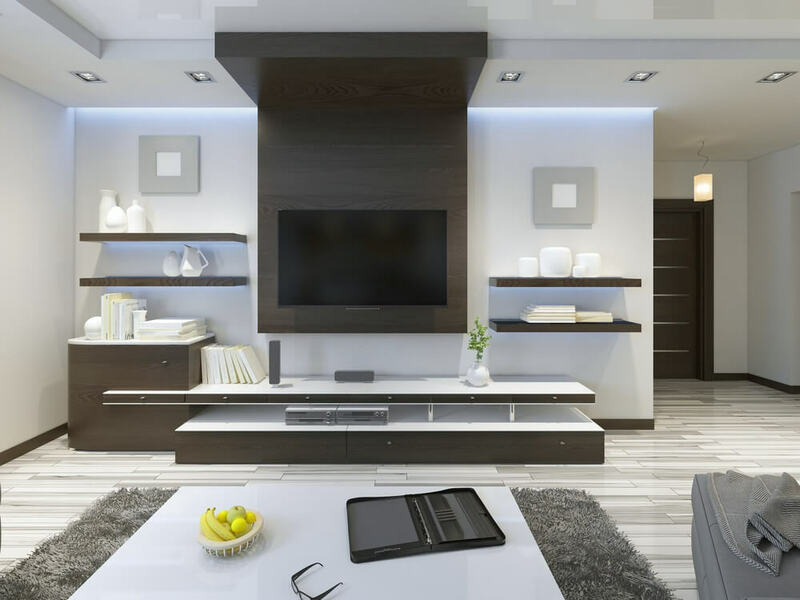 If the area around your television looks boring, install floating shelves around it. Try to keep it balanced as seen in the design below. Remember, the TV wall is your primary wall in the living room. Always make it the star of this area. Superdraft tip: Most furniture and interior design stores sell multimedia set for a hassle-free arrangement of your TV and sound system. Order the set which matches the interior design of your house and has ample amount of storage in it. 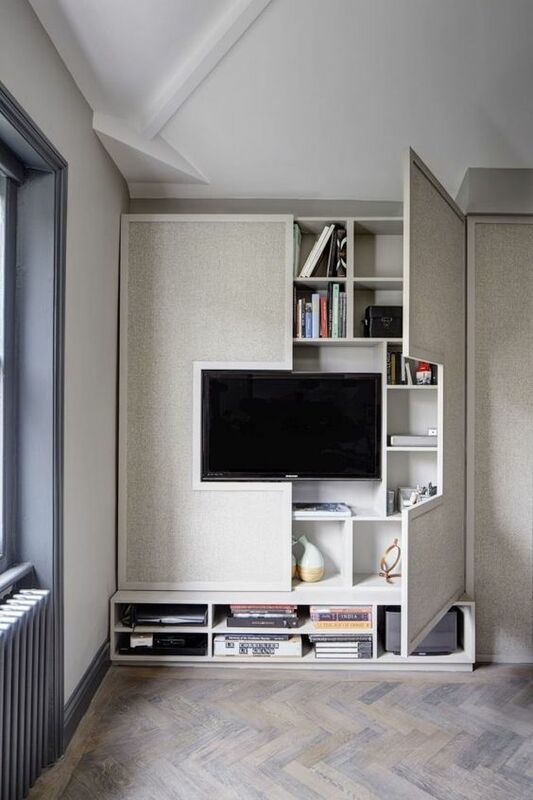 Designed for dorms and small apartment units, high shelves make use of your room’s vertical space rather than the floor space. That leaves you more room to move around the house. Superdraft tip: Install a smaller floating shelf in the room and keep it within reach. Store the books or items you always need here. The ones you don’t need all the time can stay up on the higher shelf. Push the tall shelf right next to the wall to make it a dominant element in the room. 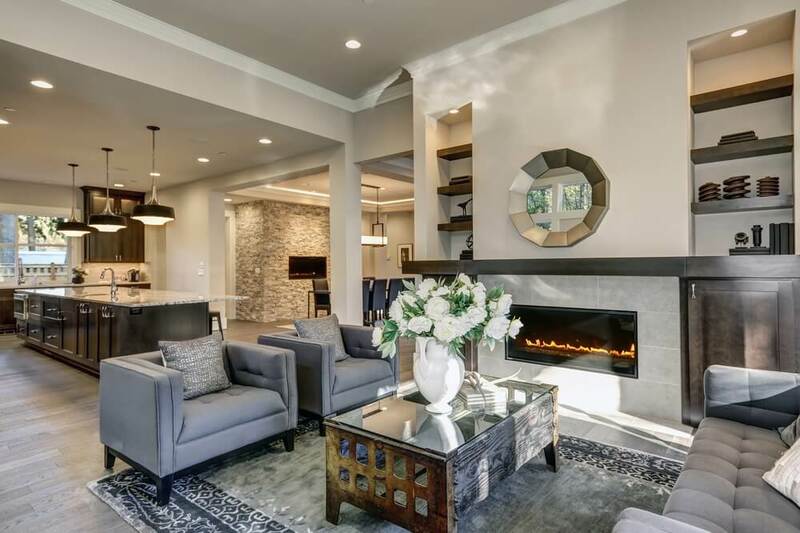 Display statement pieces strategically in each space provided. Play with height, proportion, scale, and colours. You can also leave some shelves empty. Celebrating empty space is good for your interior design too. Others keep it out of sight so they can hide some of their clutter. This is great for small apartments and hotel rooms. 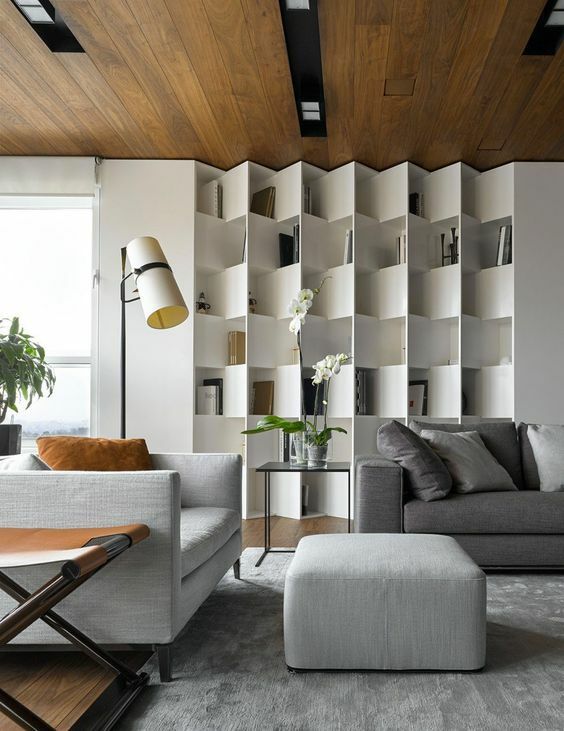 Shelving is a part of your living room’s architecture. 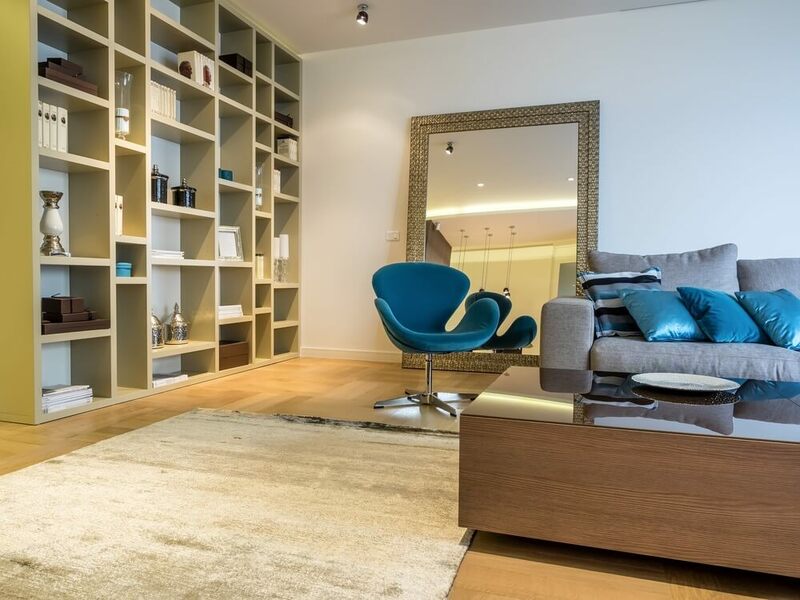 We can offer you more living room shelving ideas during a design consultation. That way, our senior home designers can see your space and recommend the best type of shelving for you. Found this article useful? Liked this article? Follow us on Facebook, Instagram, and LinkedIn.